In July 2013 a DNA project was set up for people with the Brereton surname. Spelling variations which may be related are also welcome. Find out which male Brereton lines are descended from a common Brereton ancestor. Hence provide pointers of where to look for genealogical connections. Perhaps testing will help you breakdown a brick wall in your Brereton line and point you towards your Brereton ancestors. Find out how many unrelated family lines adopted the Brereton surname. We are regularly updating a discussion of the project results. So far we have results for 13 Breretons and 1 Brewerton. 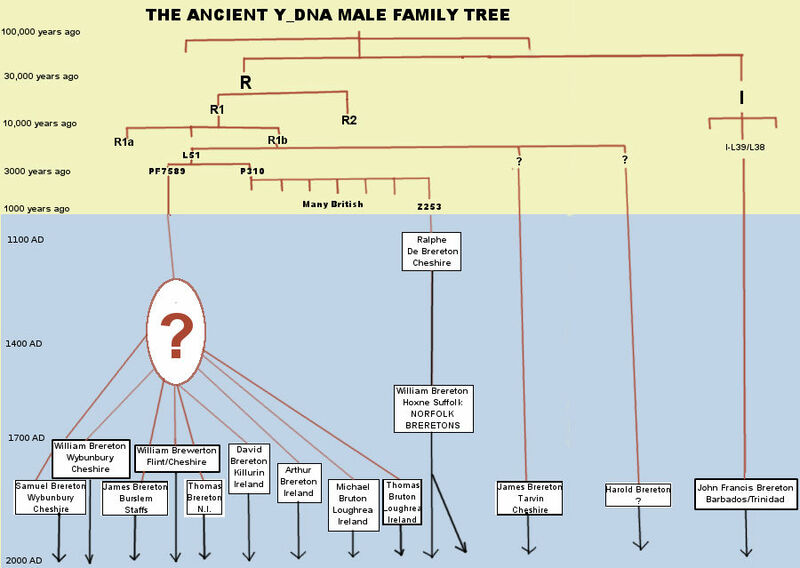 The y-dna shows that 9 of these ancestral male lines may have a common male line ancestor probably around 1400 +- a few hundred years, whereas the other 4 lines are from completely unconnected Brereton lines with no common male ancestor for thousands of years. The fact that we have found 4 or 5 completely separate groupings of Breretons who can not share a common male line ancestor this side of the Norman Conquest and the subsequent adoption of surnames in England from about AD1200, is interesting but not surprising. Undoubtedly unrelated families who lived and worked around the lands in Cheshire held by the De Breretons adopted what had originally been the place name, Brereton. Those stories one sometimes reads of all Breretons descending from the landed De Breretons are proven to be wrong. This diagram shows how the 14 lines which have been tested fit on a simplified dna descent tree. The Norfolk Brereton line which goes back to the medieval De Breretons and is a younger branch of the Breretons who built Brereton Hall. There may be some other lines descending from this family to the present day and it would be very interesting to y-dna test. This could perhaps confirm the common De Brereton origins even though they might be 17th cousins to the present day members of the Norfolk line. There is a Brereton line in Trinidad which is believed to have come from a colonial British settler in Barbados. The Dna is definitely in a very different historical group, which originated in Europe at least 5 to 10 thousand years ago. The big group of nine from Cheshire and Ireland show enough of a match between one another that they could have a Common Cheshire ancestor between 300 and some 800 years ago. At least definitely within the last 1000 years. We have now reached the stage where we need more Brereton families to encourage their men to take testing. The more families that test the more we shall be able to unravel the Brereton ancestry. Why not order a test kit and find out to which group your Brereton ancestors belong. You could discover distant genetic cousins which would serve to provide a target for your genealogical researches, or perhaps you will be in a new unrelated group of Breretons. Y-Dna is a remarkable short cut which can point the way you have descended over 100s of years, but it still needs backing up with traditional research to fill in the genealogical details of the generations. These were written by Jeanie Atkins who has been doing a one name study of her Brewerton surname for many years including using DNA tests. Finding no other Brewerton lines that share a common ancestor with her line, she was instrumental in getting the Brereton DNA project started up. Jeanie and Alyn Brereton have started a mini one name study of Breretons from the Wybunbury/Nantwich area of Cheshire, so it is worth looking at the tribal pages site. You have to request an invitation in order to view the details. A DNA sample can be easily collected for testing by doing a simple swab of the inside of one's cheek. Here is a link to order a dna test kit (at a reduced rate) and join the project. For more advice before you order please do contact me, or Jeanie.